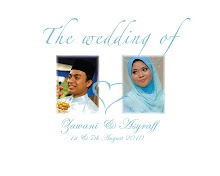 This blog has used to be a wedding blog (which I found is the least useful wedding blog ever?>.<). One pack consists of 3. If convert, this pack costs us about rm3.7 (but if using Japan en, of course terlalu murah). What you need: Brown paper bag (very cheap and can easily be found in bundle amount), gold rope (any kedai riben available), and self-designed tq-tag! Here's the close up. What you need just self folded paper bag (which I stil owe you guys the step by step post T_T) and..satin ribbon or whatever ribbon of your likings :D.